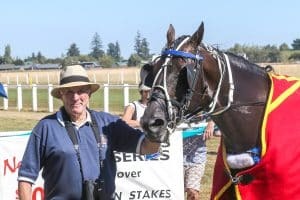 The burgeoning career of young horseman John Morrison was on full display at the Hororata meeting in Methven on Sunday. The junior driver won the Hororata Cup with a peach of a drive behind the Brian O’Meara-trained Di Caprio to complete a double for the day. It came after a bold front-running drive had resulted in an upset with the local trotting mare, Stellar Success. It was almost a treble for Morrison as he was only beaten a head by Glory Days and David White after leading up with another roughie in Victor Tango, and he ran third with Cheezel. Di Caprio, a four-year-old black entire by Shadow Play, won his first two races at Motukarara in March last year and has only once been worse than third in his last five starts. That was when he was sixth and “dead stiff” when finishing on the back of the winner Doitson on the first day of the Marlborough meeting last month. “We were late getting on to the track that day and I didn’t have a chance to warm him up properly,” said Morrison. “So he was a bit rough behind the mobile and we couldn’t keep the trail – Doitson snuck in there and won the race. “He’s a very genuine horse and there’s always been a good reason when he hasn’t been in the money. Di Caprio landed the one-one early at Methven, but when Morrison saw the three-wide train coming, he was out and around to sit parked and secure the one-one again. Gore Bay forged to the front early in the run home but he was soon a sitting duck and when he hooked wheels with Tuapeka Trick, favourite Kotare Cullen shot clear and looked in for an easy win. But Morrison was angling into the clear and had the last say, coming clear by a length-and-a-half in the end. O’Meara, formerly the trainer of Christian Cullen, races Di Caprio with Graeme and Pauline Hutchinson, ex jockey Max Skelton and his partner Annette Newman, and Kenny Moore. The latter raced horses with O’Meara when he trained in Auckland back in the late 80s, while Hutchinson and Skelton race Omar Sharif and O’Meara trained him to win his first race at Methven. Di Caprio, whose third dam is the top mare Pay Me Back, was passed in at the Premier Sale by Dave Kennedy when offered as Pay Me Debt. “I looked at him at the sales and I liked him, but they wanted 40k for him and I wasn’t prepared to pay that,” said O’Meara. “But a week later I rang Dave and told him I was prepared to pay 20k. The seven-year-old Stellar Success had not won a race for over a year, but bolted in by three lengths at odds of 26-to-one for trainer Mike Heenan. “She’s always been a bit one paced and she surprised us with how well she went,” said Morrison. Stellar Success had won three races before Sunday but she had dropped right back to a 40 rating when she lined up in a R40-54 event. 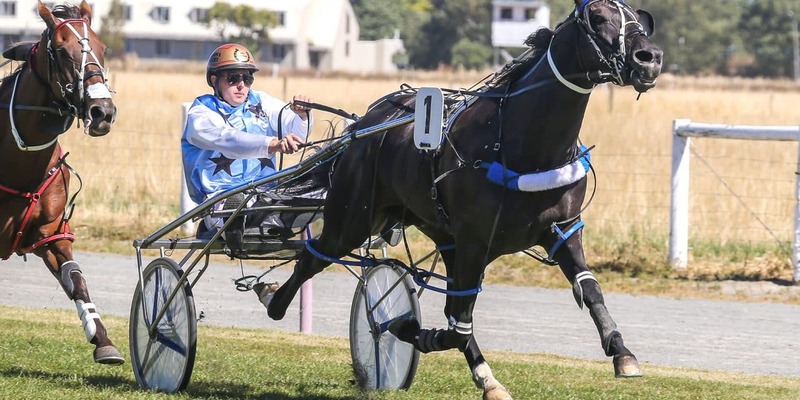 Morrison and Sheree Tomlinson have pretty much sorted themselves out at the head of the junior driver’s premiership this season, with Sunday’s double taking Morrison to 31 wins to Tomlinson’s 34. Both are set to have easily career best figures this term.